I love when a handful of safety pins can completely transform a dress. I've worn this dress in a couple different ways before, but I think this is my favorite. The silhouette is what gets me, I think! I just adore dresses that are fitted in the waist and HUGE on the bottom. Safety pinning the hem to a slip even fooled my mom, who saw me in this and at first said, "New dress?" And I show her everything I make, probably annoyingly so. We actually had a conversation about that once, which ended with me saying, "You're like my Tim Gunn!" and her quipping, "Make it work!" But anyway, the point is, I'm all for wearing clothes over and over in different ways--clothes are meant to be loved. It makes me feel unsettled to know some people wear clothes once and then donate them and buy new ones. I want people who buy the clothes I make to have that feeling where you want to wear that piece, and nothing else will do. I'll let you in on a secret: I barely wore this today! To be honest, I was lazy and in sweatpants. How embarrassing! Haha. But I dressed up for you guys. I like that, besides a log of projects and personal style, this blog is kind of a journal of sorts. I can look back on some of the best (and worst) days of the year so far to see what I was wearing and thinking. And you know what? I'm actually loving this posting every day thing. It's kind of a scramble sometimes, but as long as I can keep things of a certain quality, I'd like to try posting almost as often for most of the summer. We'll see how that goes! This is so fun. Ha. P.S. HAPPY BIRTHDAY DANA! I love you! The problem is that sometimes I just don't see the potential in the clothes and miss some awesome matching possibilities. That's why that wardrobe project was an awesome idea. Woah, I love those pics! Especially the last one. Dana - Thanks for the encouragement, darling! I hope you have a lovely party & that your rolls turned out alright! Heidi - Oh thank you, I'll keep that in mind! Coco - I feel the same way about your outfits on LB, dear! :) Thanks! It can be hard to always look at your wardrobe with a fresh eye, so you're right about the Wardrobe Project being such a good idea--even just taking the photos helped me! We could try to pick that up again this summer... I wonder if Todd would be up for that? Who else could we pester to do it? Dork Vader - Thank you! It's been so fun to get out & grab photos in this lighting. Becky - Aw, shucks. Thank you! I love that you commented on some old posts because these just generally make me laugh! 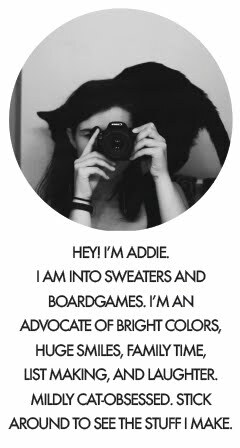 2015 Addie wishes 2010 Addie had been as confident in real life as on the blog. But those things come with time. :) Thanks for the kind words.